Sun City Carolina Lakes is a Del Webb active adult community near Charlotte in Fort Mill (Indian Land), SC. This 3,160-home community includes two large clubhouses, an 18-hole golf course, and desirable low-maintenance homes. A vibrant lifestyle and the exciting culture of Charlotte have drawn retirees from across the country. Sun City Carolina Lakes is spread across 1,512 acres of rolling hills and lush forests of pine, maple, oak, and purple plum trees. It is located near the North Carolina and South Carolina border in Fort Mill/Indian Land. Downtown Charlotte is just 25 miles north, but with everything that this community has to offer, you might never feel the need to leave. With world-class amenities, scenic views, shimmering lakes, and over 135 clubs, this active adult community is the ideal place to call home. The Sun City Lake House is a magnificent 55,000 square-foot clubhouse and recreation center. This grand facility at the heart of the community serves as the centerpiece for all social activities, fitness classes, and sports events. It includes a state-of-the-art fitness center that showcases the latest top-notch weight training and cardiovascular equipment. The fitness area also includes an indoor lap pool and spa, an aerobics and dance studio, and an indoor walking track. Additionally, hobby and craft studios, classrooms, a woodworking shop, grand ballroom, cafe, computer lab, library, and a demonstration/teaching kitchen are available at The Lake House for the residents. The grounds are adorned with an enviable array of amenities that beckon to active adults. Surrounding the clubhouse are eight clay tennis courts, pickleball and bocce ball courts, and an outdoor resort-style pool. A brand new outdoor amenity center includes a softball field, basketball court, additional pickleball courts, and a community garden. The Lodge is Sun City Carolina Lakes newest clubhouse. This 13,000 square-foot has a huge ballroom that hosts performances and other large events. A covered pavilion connected to the clubhouse by a covered walkway provides additional space for outdoor events. An outdoor resort-style pool, patio, and two pickleball courts round out the outdoor amenities at The Lodge. The community is dotted with ten scenic lakes including a large lake behind the clubhouse with a fishing pier. The Catawba River skirts along the western border of the community and is great for kayaking, canoeing, and fishing. Connecting it all together is an intricate system of walking and biking trails that wind through the preserved wetlands, woods, and neighborhoods. Also available to residents of the community are a dog park, a wood working shop, a stained glass studio, and public gardens. There are numerous real estate options for homebuyers in Sun City Carolina Lakes. Del Webb broke ground on the community in 2005 and completed construction of the 3,160 homes in 2016. Del Webb has designed the homes to meet the needs of active adult buyers. Expansive great rooms, open gourmet kitchens, and ample outdoor living space are characteristic of most homes in this 55+ community. Buyers can choose from single-family homes, villa townhomes, and carriage homes. Single-family homes are the most popular option for buyers in this community and they are offered in the River, Summit, and Manor Collections. There are single-family floor plans that range in size from 1,103 to 2,597 square feet. Some homes offer an optional loft that includes a bedroom, full bath, and recreation room. All single-family models include a minimum of two bedrooms, two bathrooms, and a two-car garage. The larger homes include additional bedrooms and bathrooms. The villa townhome models available include three choices from 1,090 to 1,455 square feet available as resale only. The villas are arranged in duplex or triplex configurations and include two bedrooms, two baths, and a two-car garage on one level. Carriage homes enjoy single-level living with their residence on either the first or second level. First-floor units enjoy ground level patios, covered porches, and no stairs, whereas second floor units are accessible via stairs and include covered porches. The one and two-car garage units range from 1,554 to 2,044 square feet. The lifestyle in Sun City Carolina Lakes is unmatched by any other active adult community in the Charlotte area. A fitness and activities director in the community is there to ensure that residents have the ability to lead a well-rounded lifestyle. Whether your idea of activity consists of social clubs, sports teams, or simply mingling with friends at the various neighborhood events, there is something for everyone in this active adult community. Perhaps you're interested in rekindling an old hobby or possibly starting up a new one. 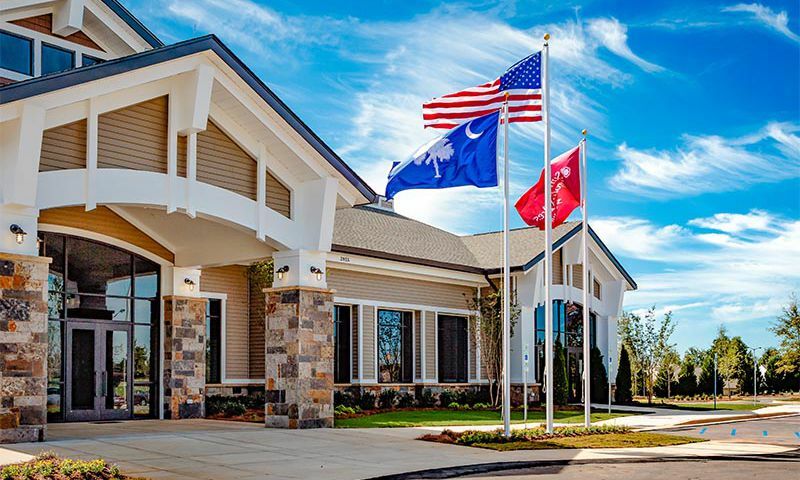 There are over 135 clubs and interest groups in Del Webb's Sun City Carolina Lakes. Some of the more popular groups include card clubs like bridge, euchre, bunco, canasta, and Mah Jongg or craft and hobby clubs such as painting, ceramics, woodworking, stained glass, and quilting. Sports enthusiasts enjoy the various fitness-minded clubs such as golf, tennis, bicycling, bocce ball, and pickleball. Other residents find joy in the book clubs, continuing education classes, religious groups, singles club, wine tasting, or photography groups. Regardless of your passions, you are sure to find other like-minded residents who share your interests. Sun City Carolina Lakes is quietly tucked away from the hustle and bustle of the Charlotte metro area, yet conveniently close to everything the city has to offer. The community is just minutes away from shopping, dining and entertainment venues, and close to award-winning hospitals. The Charlotte Douglas International Airport is less than 30 minutes away. Most everyday shopping needs are accomplished in the Carolina Commons Shopping Center near the entrance to Sun City Carolina Lakes, which is accessible via golf cart for residents. When it is time to get out, residents of Sun City Carolina Lakes like to head to uptown Charlotte where great museums, performing arts centers, and professional sports teams await. Residents looking for a new or resale home in an active adult community should look no further than Sun City Carolina Lakes by Del Webb. The Lake House - 55,000 Sq. Ft. There are plenty of activities available in Sun City Carolina Lakes. Here is a sample of some of the clubs, activities and classes offered here. The Villas Collection is available as resale only. These attached homes offer 1,090 to 1,393 square feet of living space with two bedrooms, two bathrooms, and a two-car garage. The River Collection Offers floor plans that range from 1,103 to 1,416 square feet in size. These single-family homes offer two to three bedrooms, two bathrooms, and an attached two-car garage. The Carriage Collection includes four townhome models that range in size from 1,554 to 2,044 square feet. Hombuyers can find one of these floor plans that offers two bedrooms, two bathrooms, and an attached one or two-car garage. The single-family homes in the Summit Collection can be found as new and resale. These homes' optional lofted floors offer an extra bedroom, bathroom, or storage space. The Manor Collection of single-family homes offer 2,051 to 2,597 square feet of living space with two to three bedrooms, two to three-and-a-half bathrooms, and two to two-and-a-half-car garages. Bottom line: No other active adult community in the Charlotte offers offers the full features resort style life that you'll find at Sun City Carolina Lakes. You've got to include it in your priority list. We moved here from the SW because we wanted mild seasons and to escape extreme heat. None of our family lives close by, so making new friends and keeping active was our priority. Sun City is large enough to satisfy both needs. If you can't find friends who suit you or clubs and activities you enjoy, it is your fault, not the community. I enjoy arts, crafts, exercise, and creative outlets. Today I'm with others enjoying an "off-campus" writing retreat. Last night a bocce game. We lost, but had a lot of fun. Sun City is where I belong. Sun City Carolina Lakes is not just a community it's a lifestyle. My wife and I have been amazed with all there is to do here. After looking all around the Charlotte region, there is no other place that has as much. Being retired,we want our financial resources to go as far as they can. Well we found the place. Great SC taxes, lower HOA fees than just about every other 55+ location, plus the county takes care of our roads saving us a ton of money. Take a look, I'm sure you'l be impressed as well. You can take advantage of what Charlotte offers and you're only a short drive to the mountains or the shore. By the way, Michelle T. is mistaken. We never had guards, they were Greeters for people visiting the community when the builder was still here. Also there is a Family Swim time only on weekends for visiting families. Children must be accompanied by an adult. The times were picked outside the normal "rush" time. I've brought my grandchildren and have never seen a problem. After an in-depth search of several 55+ active lifestyles communities within very close proximity to Charlotte, NC, Sun City Carolina Lakes clearly distinguished itself as "hands-down" -- the #1 marquis community during our selection process as we transitioned from New York 2 years ago. We were greatly influenced by it's expansive and impeccably manicured landscaping and unprecedented diversity of amenities - underscored by an extraordinary and highly active social lifestyle. Sun City Carolina Lakes is the benchmark and continues to raise a high bar for other 55+ communities who can't compete. Simply stated, this community is incomparable! This community is the perfect size and location. Although there are many homes, they are divided by rolling hills and trees into small neighborhoods. And with several thousand residents, we have every club and activity you could desire. This location in SC has moderate seasons, easy access to everything Charlotte offers, yet not the higher taxes of NC. We love SCCL. We moved here in 2015 & couldn't be happier You can be as busy as you want, learn new things, make wonderful new friends. If you aren't happy here, you need to look inward for the reason. Our kids call it "summer camp". I have lived here for 6 year and every year gets worst no more security at gates our yards are not taken care of like they did at the beginning when they were trying to sell their homes. The swimming pool as more kids in it then the YMCA. The second pool that was to open over two years ago for adults only as cracks in ti so never opened yet. Now they are mowing our lawns on Saturday for 2 hrs a day between 2 and 4 we can't even have people over or sit out there and enjoy ourself on our golf view our barbeque we would have grass flying in our food. So for two hrs on a weekend we get to listen to the loud mowers and the edging and th loud blowers that is not right by any means and the complain about one extra pot in a yard I hate this place. Watch what you are getting into. We have lived here for five years and bought a resale. Everyone in the community has a Pulty "beef". Foundation cracking is definitely and issue as is drainage and security. Although they now have "cameras" anyone can get in or out. No gates at the front entrance. The second pool has never been opened, except for a couple of weeks last year, due to faulty construction. Cheaply built. Fabulous and Friendly Community. Previous review that most homes have cracked foundations is incorrect. Several homes in one small neighborhood have had issues with their concrete slabs. Pulte has been very responsive and repairs are being made. Yes, there are restrictions that we have to follow but that's what keeps our wonderful community clean and appealing, and happy neighbors. If you want to live in a trashy, eye sore community, then SCCL isn't for you! 140+ clubs and interest groups, sports such as bocce ball, pickle ball, tennis, soft ball, horse shoes, swimming, fishing, and the list goes on. There's something for everyone! Moving across the country is a huge decision, especially at this stage of life. We were thinking about moving for a while, but when we saw Sun City Carolina Lakes, we knew this would become our new home. The amenities are beyond our wildest imaginations, we still pinch ourselves because it's almost too good to be true. The residents are so caring and considerate and everyone looks out for each other. When I saw that we have a restriction on the number of pots that we might have in our back yard it has turned into a poor excuse for a neighborhood* I Have done my backyard very tastefully done.. Maybe 2 pots extra. This is a very sad community run by a lot do-gooders that they know nothing in taste. Moved here mid-2016 and every day just gets better. I tell my husband that it feels like we're squatters at a gorgeous country club -- all the amenities seem too good to be true! No matter what you like to do, you can probably find it here. Unlike a lot of "active adult" communities I've seen, the population here is, indeed, active and involved in all types of fun activities. If you're not sociable, I suppose you could just sit and enjoy your lovely home, with gardeners taking care of your lawn, etc. But even if you can't participate in sports, you can play cards or paint or work in clay or sing....and on and on. Cannot recommend the lifestyle here strongly enough. Just to update what was written here, Sun City Carolina Lakes now has two amenity centers, each featuring a huge ballroom, swimming pools and exciting outdoor pavilions. For the sports minded, there are eight clay tennis courts, eight pickleball courts, a fantastic softball field with covered bleachers, a dozen horseshoe pits and walking trails winding throughout the community. That doesn't cover it all but it might give you an idea of the immense opportunities provided our residents. We just bought a resale house here this spring. So far it has been fantastic! The fitness center and the pools have been my go-to places for the past couple months. My health is already improving! Having an indoor walking track has been great for the really hot days and I can imagine it will be nice when the temps start to dip. Aside from our health improving our social life is like we're back in high school! We have meet a lot of nice people here and have jumped right in to clubs and activities. We feel encouraged by the other people living here and it's a wonderful feeling! We moved here in 2010 and have loved every minute. It's like being on vacation every day. The amenities are fabulous. From our first visit to the community we knew it would be our new home. We've meet wonderful people here and love being involved with so many activities. If you enjoy being social and keeping busy you'll love it here! Presently building our new home in this wonderful community, cannot wait until we move in and start this new chapter in our lives ! ! ! 55places.com is not affiliated with the developer(s) or homeowners association of Sun City Carolina Lakes. The information you submit is distributed to a 55places.com Partner Agent, who is a licensed real estate agent. The information regarding Sun City Carolina Lakes has not been verified or approved by the developer or homeowners association. Please verify all information prior to purchasing. 55places.com is not responsible for any errors regarding the information displayed on this website.